Marijuana (also spelled marihuana, and colloquially known as "weed", "pot", "joint", and "reefer") is the name given to the flowering buds of the Cannabis genus of plant, divided into the species Sativa, Indica and Ruderalis, prepared for human consumption. The main psychoactive ingredient in marijuana is THC, or delta-9-tetrahydrocannabinol, an organic chemical compound which imitates natural cannabinoids produced in the human body. Because THC is considered harmful, marijuana is generally illegal to possess, cultivate and sell in most countries, although it is legal in some liberal states. In some extremely liberal jurisdictions, you can even buy it in a vending machine. Marijuana is a highly addictive drug that causes short-term memory loss, malaise, psychosis in predisposed individuals, violence and violent fits, as well as impairment of physical and mental functioning. Studies confirm and even defenders of marijuana admit that it causes violent paranoia. Marijuana use may contribute to a rise in brain tumors. While some pretend that cannabis has "medicinal" benefits (see Medical marijuana), many scientists debunk that fiction and observe that there are numerous federally approved medicines for the diseases that "medicinal" marijuana has been used to treat. Marijuana consumption impairs one's ability to drive, thereby creating enormous hazards on the road. As of early 2019, only two countries have legalized recreational use of marijuana, as in 2013 socialist Uruguay legalized the drug, and Canada, under Trudeau's Liberal Party, legalized marijuana in October 2018. In the United States, nine states have "legalized" the recreational use of marijuana: Alaska, California, Colorado, Oregon, Massachusetts, Maine, Nevada, Vermont and Washington, along with Washington D.C., but not all allow sales of marijuana. All but three conservative states have either decriminalized marijuana or allowed limited medical usage for specific medical conditions. However, due to the Supremacy Clause, federal law, under which marijuana is illegal, overrules those states which have legalized or decriminalized, so their "legalization" is only de facto effective to the degree to which the federal government refrains from enforcing federal law. Marijuana was first restricted in the United States on the federal level in 1937, with Franklin Delano Roosevelt's signing of the 1937 Marihuana Tax Act. From 1973 to 1978, several US states "decriminalized" marijuana, meaning that they would not enforce state laws against minor marijuana use and possession. This began with Oregon, and was joined with Alaska, California, Minnesota, Mississippi, North Carolina, and Nebraska. In 1996 in California, a voter referendum legalized the use of marijuana for medical usages, allowing it to be used for any condition for which a patient presented a doctor's recommendation. Arizona also passed a medical cannabis ballot measure, but it was rendered ineffective on a technicality. Other states followed, and in 2014 Utah became the first state to legalize only some derivatives of marijuana, not the full drug itself. In 2012, Washington and Colorado "legalized" recreational marijuana by voter initiative; by early 2018 the number of recreational legal states reached nine with the addition of Vermont. Marijuana is a Schedule I Controlled Substance in the United States of America, meaning that it is illegal under federal law of the United States, and considered to have no redeemable medical value. According to the FBI, in 2012, there were 658,000 arrests for marijuana possession compared with 256,000 for cocaine, heroin and their derivatives. Many liberals have advocated for decriminalization, including National Organization for the Reform of Marijuana Laws, Marijuana Policy Project, and Law Enforcement Against Prohibition. On July 26, 2014, the New York Times published an editorial calling for removing federal controls over marijuana for people 21 and older, leaving the question to individual states. Many American conservatives, especially social conservatives, oppose legalization of marijuana in any form due to its perceived harmful medical and psychological effects and its likelihood of harm to third parties due to drug-related crime and reckless driving. A few libertarian-leaning conservatives, most notably Ron Paul, William F. Buckley, and Larry Elder, have advocated the decriminalization of this drug. Some liberals support legalization, but most instead advocate for drug treatment and rehabilitation. Libertarians are usually the biggest supporters of marijuana legalization. Gary Johnson, a former Republican and 2012 Libertarian Party Presidential candidate for President, is the highest ranking US politician to advocate for marijuana legalization. He was a two-term Governor of New Mexico. Legalization on a Federal level is virtually impossible, since the United States was a major leader in the international treaty known as the Single Convention on Narcotic Drugs of 1970. Said treaty is defined by the Constitution as carrying equal weight to an Amendment to the Constitution; therefore, the only way marijuana could ever be legal on a Federal level is if we withdrew from a treaty of our own creation as a prerequisite to legalization. The Netherlands decriminalized the use of marijuana in 1976. As a result, marijuana use among the 18-25 age group doubled, however, despite its availability, marijuana use in the Netherlands is lower than the European average. The Netherlands also saw an influx of "drug tourists" and other undesirables, as well as an increase in crime. This has since leveled out, leaving the Netherlands with one of the lowest crime rates in Europe. In several countries, particularly in Western Europe, cannabis use has been decriminalized. However, in many other countries, particularly those in the Middle East and Asia, possession of even small amounts of cannabis can be punishable by death. In 2013, Uruguay initiated nationwide legalization of recreational marijuana, becoming the first developed nation to do so in the modern era. Canada legalized recreational cannabis in October 2018, allowing "pot shops" that sold marijuana under the ruse of "medicinal" purposes to drop the pretense and begin selling marijuana openly for recreational purposes. Marijuana contains many of the same carcinogens as tobacco, and some research suggests that when smoked, it shares the same risk of lung cancer If smoked, marijuana also leads to a temporary increase in heart rate and blood pressure resulting is a slight increase in the risk for heart related problems including heart attack. Chronic smokers often suffer from mild withdrawal symptoms, however marijuana is not believed to be physically addictive. Marijuana can impair judgment, motor skills, and balance. Prenatal exposure to marijuana has also been linked to impaired learning and developmental disability in children. If marijuana is consumed heavily and on a daily basis by children around the age of 12 for a period of years, even liberal scientists have been forced to conclude that humans have a 1/4th random chance of developing psychosis, based on a random genetic trait. However, all of these adverse effects, which have been the motivation for making recreational use of marijuana illegal, are typically ignored by the liberal advocates of recreational marijuana use, who use deceitful and dismissive arguments (including the creation, publication and use of fraudulent "studies" which claim to "debunk" the science proving the negative effects of marijuana, without offering any legitimate proof behind their "debunking" claims) against keeping marijuana use illegal to justify its use and are motivated both by politics and simply by doing what they want at the expense of public health and safety. Advocates of marijuana claim that the active ingredient in marijuana, THC, has been shown to produce some short-term psychological and medicinal "benefits", which are probably more than offset by the medical harm. For example, Harvard University conducted a study on the effect of Δ-9-Tetrahydrocannabinol on certain lung cancers, claiming that THC might help reduce a lung cancer tumor size by as much as half. In addition to a significant reduction in tumor size, there was a reduction in lesions on the lungs by 60%, and a reduction in protein markers associated with the progression of cancer. Marijuana is used to relieve symptoms experienced by patients afflicted with ALS. Marijuana is an antispasmodic and anticonvulsant is used in the treatment of seizures. 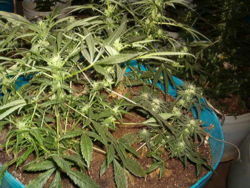 Marijuana is also used in the treatment of migraines, arthritis, depression, and glaucoma. However the effect of marijuana on intraocular pressure (IOC) is not as effective as those offered by other drugs on the market. In states where marijuana is legal (either completely or via medication), parents of young children have been known to seek out strains that are high in Cannabidiol (CBD) and low in THC; Cannabidiol is known to counteract the "high" of THC, and is believed to be the cause of the anti-seizure effects when consumed. There have not been many in-depth and widely distributed studies into the possible medicinal effects of marijuana. However, with political pressure from liberal advocates of marijuana, more accredited institutions are conducting research on the drug. Despite state legality, physicians are reluctant to prescribe "medicinal" marijuana fearing it may jeopardize their DEA license to prescribe controlled substances. "Medicinal" marijuana is used by physicians as a last-resort in states where it is legal or semi-legal (under state law), but also misused by people who simply want to get high. "Medicinal" marijuana, however well-intentioned and beneficial, will also lead to abuses in that system. Marinol (a brand formulation of dronabinol) is a schedule III controlled substance, approved for relief of nausea and vomiting in persons undergoing cancer chemotherapy and to improve appetite in persons with AIDS. It is dispensed in gelatin capsules containing synthetic Δ-9-Tetrahydrocannabinol dissolved in sesame oil. Liberals advocating "medicinal" marijuana do their best to ignore this drug. A 1998 survey of physicians, addiction specialists and police demonstrated no evidence or concern about the abuse, dependence or diversion of Marinol. About this time, the DEA moved the drug from schedule II to the less restrictive schedule III. Carl Sagan used recreational marijuana to help "open his mind". Cannabis was first cultivated in China around 4000 B.C. U.S. Declaration of Independence was not written on hemp paper, despite popular belief by liberals. An average human will pass out after consuming 1/14 of the LD-50 of weed, which is why no overdoses have ever been reported. Driving while high, however, is extremely dangerous. Barack Obama has admitted to use of marijuana. Former President Bill Clinton has also admitted to smoking marijuana, but claims that he "did not inhale". Former President George W. Bush privately admitted to smoking marijuana, but stated he wouldn't state it publicly "'Cause I don't want some little kid doing what I tried." ↑ The sale of marijuana is illegal virtually everywhere in the world (other than Uruguay, and as of mid-2018 Canada), and results in long prison sentences in many places. In Portugal, Argentina, California and South Australia, the use (rather than the sale) of small quantities of marijuana is allowed. ↑ Jeannette Kidd (1970). Marihuana Tax Act of 1937: Its Causes and Effects. University of Wisconsin--Madison. ↑ Emily Dufton (5 December 2017). Grass Roots: The Rise and Fall and Rise of Marijuana in America. Basic Books. ISBN 978-0-465-09617-6. ↑ "Voters Approve Measure to Use Pot as Medicine", Los Angeles Times, November 6, 1996. Retrieved on February 9, 2018. ↑ "First-of-its-kind medical marijuana law signed in Utah", RT, March 26, 2014. Retrieved on February 10, 2018. ↑ 11.0 11.1 "Repeal Prohibition, Again", New York Times, July 26, 2014. Retrieved on July 27, 2014. ↑ (24 July 2015) The Third Way: A Plea for a Balanced Cannabis Policy. BRILL, 57–. ISBN 978-90-04-29319-9. ↑ Psychology Today: Is Marijuana Addictive? ↑ Reitman, Janet. "Jahar: The Making of a Monster", July 17, 2013. ↑ Schatman, Michael (September 6, 2013). Medical Marijuana: The Imperative of Educating Physicians. ↑ The Bulletin of Cannabis Reform. ↑ Calhoun, S. R.; Galloway, G. P.; Smith, D. E. (1998-04-01). "Abuse potential of dronabinol (Marinol)". Journal of Psychoactive Drugs 30 (2): 187–196. doi:10.1080/02791072.1998.10399689. ISSN 0279-1072. PMID 9692381. https://www.ncbi.nlm.nih.gov/pubmed/?term=9692381. ↑ Proposed Rules - 1998 - Schedules of Controlled Substances: Rescheduling of Synthetic Dronabinol (Martinol®; (-)-Δ9-(trans)-Tetrahydrocannabinol in Sesame oil and Encapsulated in Soft Gelatin Capsules) From Schedule II to Schedule III. (en-US). This page has been accessed 363,804 times.